Congratulations to "Sue P.", the winner in Kathleen's giveaway. Thank you to all who participated! If you stopped by yesterday, you met the heroine of ImpossibleRansom, Val, and learned why Nick O’Shea was the perfect man to bring into her life. A romance needs two main characters, however, meaning that Nick also had to meet the perfect woman. Since I always fall in love with my story’s hero, I pay particular attention to the women who line up hoping to meet Mr. Right. I’m very careful, because I can’t let the wrong woman fool me and wiggle her way into the book. To my mind, Nick deserved a happy-ever-after, and I was the one person with the power to see that he got his due. In Impossible Ransom, Nick’s polar opposite, Valeria, qualified for the job. She grew up rich and privileged, he grew up poor and street-smart. She is soft and trusting, he is hard as nails and cynical. She hates him in the beginning of the story, which in the end, only makes their love stronger. But most important, she can see the good in him even when he refuses to acknowledge it exists. Nick needed a heroine who could take away the blinders he’d been wearing for years and make him see the truth about himself. To do this, she had to work a kind of miracle, breaking through the barriers he’d built between himself and the world. What better place to force the intimacy needed to demolish those barriers than a desert island where killers were nipping at their heels and they could die at any moment? Before Nick met Val, he didn’t care if he died on a mission, because he believed he was a despicable human being. In his eyes, his life was worthless. But over the course of their adventure, Val saw the good in Nick and forced him to become a better man. The love of a sweet, kind woman motivated him to change. He’d never thought love would find him, always believed he was unworthy. But by the end of the story, he sees life in a new way and has regained his self-respect. Please pick up a copy of Impossible Ransom and follow Nick’s quest to become whole and find true love. 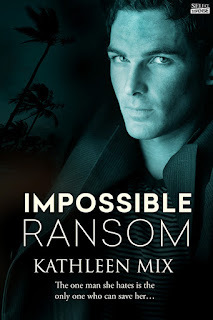 Comment on today’s post to win an electronic copy of Impossible Ransom. I look forward to finding out more about Nick & Val.